Author(s): Asim Azhar, Interdisciplinary Biotechnology Unit, Aligarh Muslim University, Aligarh-202002, UP, India. Ejaj Ahmad, Qamar Zia, Mohammad Owais, Ghulam Md Ashraf. King Fahd Medical Research Center, King Abdulaziz University, P. O. Box 80216, Jeddah 21589, Saudi Arabia. Therapeutic proteins are engineered proteins produced in the laboratory for pharmaceutical use. With the advent of recombinant DNA technology, the proteins can be generated in specific host cells under defined conditions. In the process of production of genetically engineered animals, the gene of interest can be added at a single cell stage to produce a cloned animal from genetically engineered cells. 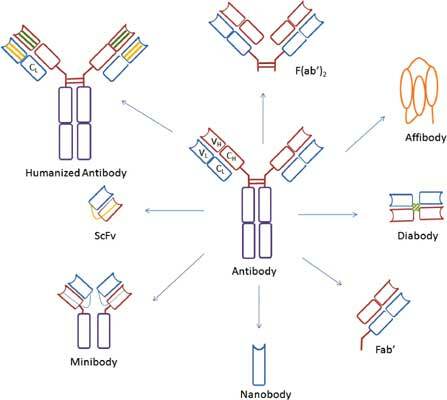 Several recombinant cytokines, clotting factors etc have been licensed and are currently being utilized for the treatment of cancer, infectious diseases, hemophilia, anemia, multiple sclerosis, and hepatitis B/C. Therapeutic proteins that are useful for human are successfully produced in poultry as well as in livestock animals. However, the fastest growing class of therapeutic proteins are antibodies especially monoclonal antibodies (mAb), the most important class of therapeutic protein with the potential to generate significant revolution in terms of clinical success rate. Here, we review the most recent clinical advances in the field of emerging and existing therapeutic proteins. Keywords: Chimeric antibodies, clotting factors, cytokines, hormones, medicinal chemistry, therapeutic proteins. Affiliation:Interdisciplinary Biotechnology Unit, Aligarh Muslim University, Aligarh-202002, UP, India., King Fahd Medical Research Center, King Abdulaziz University, P. O. Box 80216, Jeddah 21589, Saudi Arabia. Keywords:Chimeric antibodies, clotting factors, cytokines, hormones, medicinal chemistry, therapeutic proteins. Abstract:Therapeutic proteins are engineered proteins produced in the laboratory for pharmaceutical use. With the advent of recombinant DNA technology, the proteins can be generated in specific host cells under defined conditions. In the process of production of genetically engineered animals, the gene of interest can be added at a single cell stage to produce a cloned animal from genetically engineered cells. Several recombinant cytokines, clotting factors etc have been licensed and are currently being utilized for the treatment of cancer, infectious diseases, hemophilia, anemia, multiple sclerosis, and hepatitis B/C. Therapeutic proteins that are useful for human are successfully produced in poultry as well as in livestock animals. However, the fastest growing class of therapeutic proteins are antibodies especially monoclonal antibodies (mAb), the most important class of therapeutic protein with the potential to generate significant revolution in terms of clinical success rate. Here, we review the most recent clinical advances in the field of emerging and existing therapeutic proteins. What We have Learned about Pain from Rodent Models of Arthritis? Adiponectin: An Endothelium-Derived Vasoprotective Factor? CCL17/Thymus and Activation-Related Chemokine: A biomarker for Churg-Strauss Syndrome?